The Jersey City Locksmith Team is an expert group of locksmiths that service Jersey City and its surrounding areas. With more than 25 years of locksmith experience, the Jersey City Locksmith Team can be counted on to provide the best service in the industry. An innovative group, we pride ourselves on staying up to date with the latest technology so that we can creatively approach your problems and come up with a unique solution that will meet your needs perfectly. Unfortunately, there are many locksmiths in the world that conduct themselves in a less than honorable fashion. However, the Jersey City Locksmith Team is committed to being the type of locksmith service that you can trust, which is why all of our locksmiths are fully licensed and continue to participate in all levels of professional development. We have staff members dedicated to residential and commercial locksmith services, as well as dedicated locksmiths for automobile locks and keys. No matter what type of locksmith you need, Locksmith Jersey City has what you need. Automobiles: We provide all manner of emergency and preventative services for your automobile locks. Whether you are locked out or have just lost your keys, we have the technology to get you back on the road in a snap. Residential: We know that keeping your home safe is your top priority, which is why we provide services such as: lockout help, lock and key replacement, security door installation, and door and hardware repair. Additionally, we can come out and inspect your home to make sure that it is secure. Commercial: We service all businesses, regardless of industry, and have the expertise to help you design and manage any lock system. 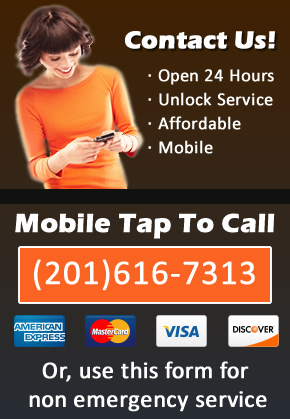 We are proud to serve the Jersey City Area for all of your locksmith needs. The next time you need a locksmith, call the Jersey City Locksmith Team! We are more than ready to help you! Call (201) 616-7313 for emergency locksmith service or to make an appointment for non emergency services.